I was taught how to play go by a doctor from San Francisco. That was in 1973. Bobby Fischer had won the World Chess Championship the previous year and the doctor, after finding out that I was a good chess player, asked me to play a game with him and tried to beat me. When he failed, he showed me how to play go, and easily trounced me game after game. 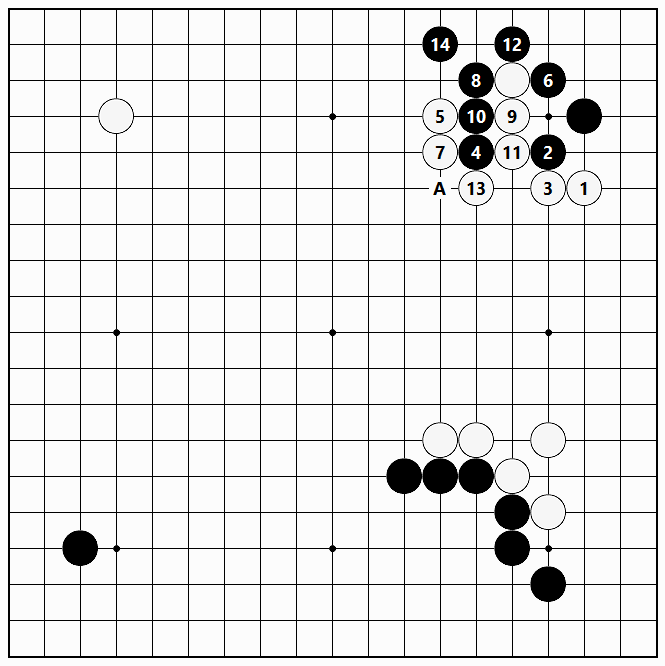 Most of all, I enjoyed Takagawa’s straightforward approach in "Vital Points of Go." In fact, one of his nicknames was "Boshi" ("Cap") because he often capped opponents’ stones in a direct manner. The following article gives a good idea of the simplified aspect of his style of play. There is one more thing that I should add. 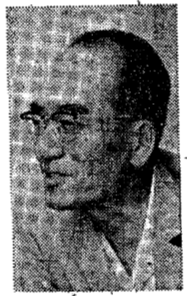 Years later, Michael Redmond told me that he had made a careful examination of Takagawa’s games. 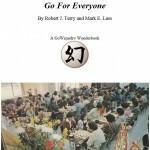 Professional players in Japan are required to study all of the games of Shusaku, which Michael had done, and he was given a four volume set of the games of Go Seigen, which he also studied. But he sought out the games of Takagawa as well, and played through them. That shows how much Takagawa is respected in the professional world of go. 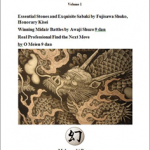 The best method for studying the fuseki [opening] does not involve memorization. It is by way of building experience as the foundation for the development of "perception." It can necessarily be stated that the fuseki is a matter of perceiving kandokoro [vital points or intuition for the best places to play]. Whether one’s stones land on those essential points or not determines the outcome of the game. Those interested in replaying the game move by move can click here to do so. 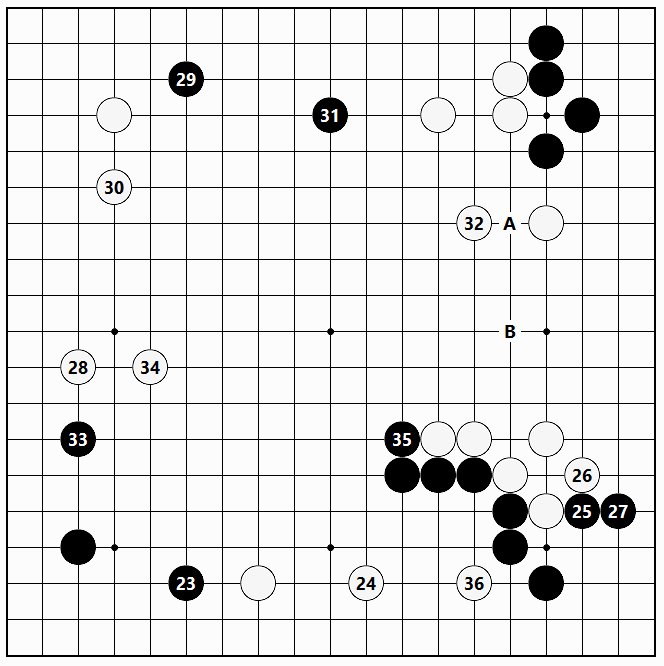 Hashimoto Shoji (Black) — Takagawa (White) White wins by resignation. I was 53 years old when I won the Meijin title [in 1968; at that time the title was sponsored by the Yomiuri Shinbun [Newspaper]; in 1977 the Asahi Shinbun took the sponsorship over while the Yomiuri started the Kisei tournament] and this game comes from the Meijin league of that year. 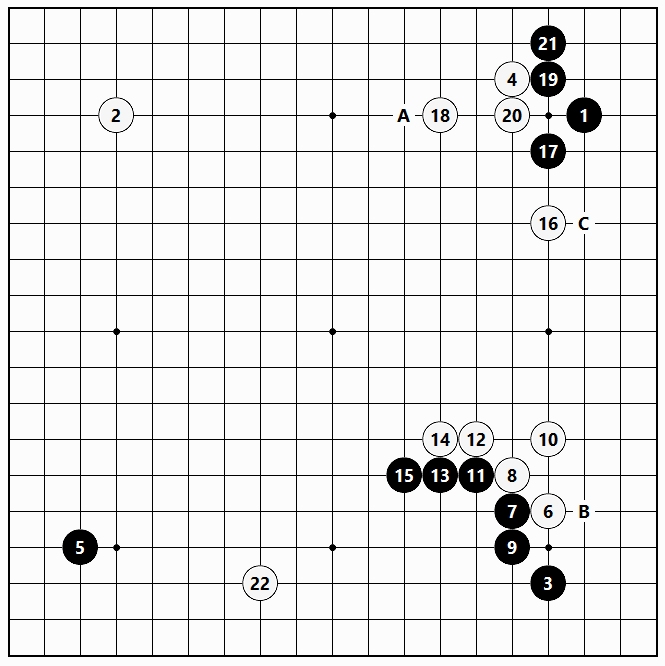 The moves through White 6 are an ideal example of the contemporary Shusaku style [of the opening]. Here, there are a number of ways that Black can react. There is the two space high pincer of A, the attachment below at B, and then, Black 7 as played in the game, etc. When Black chooses the move at 7, a large scale game results, with both sides developing large territorial frameworks [moyo]. Black 13 is one turning point in the game. This is questionable. If one asks what is questionable, it is that at the present time a territorial framework is coming into existence on the lower side. Therefore, White would like to head there as quickly as possible. 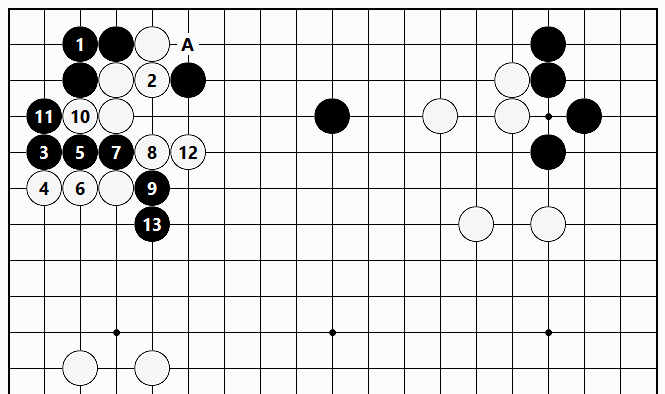 But that would allow Black to make the two space extension to C, rendering White’s thickness practically useless. This would be unbearable for White. To address this, "White first attacks Black’s single stone, hoping to be able to take sente to turn to play on the lower side." This is how opening strategy is formulated. Pressing in on the upper right corner in a similar way with White 1 is a more severe way of playing, but here it is no good. Just showing one possible variation, play proceeds through Black 14, and White has to defend the cutting point at A. That means that White in gote, and so would be unable to turn to play on the lower side. …it would be at A or B. A move at C would be unbalanced, not working well with Black’s stones to either the left or right. Young Shoji played Black 23 (naturally! 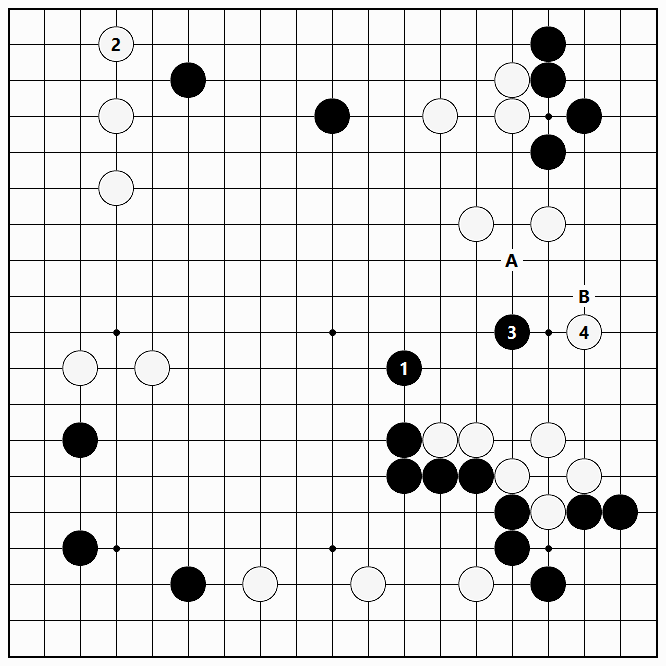 ), forcing [kikashi] White 24, then played Black 25 and 27, putting the emphasis on territory. That is quintessentially in keeping with his territorially tight style. Had I been playing Black, I would have not have made the moves of 25 and 27. In my opening play, I dislike going too directly for territory. Therefore, I would probably develop with Black 1 and 3. But naturally, White would come at Black with 4. Without doubt, these Black moves are big in this position. Answering White 4 with Black A would be absolutely terrible after White draws back at 6, so Black would resolutely counterattack with 5, 7 and 9. The variations that would come from this are complex and difficult. They belong to the realm of the middlegame, and so they have been omitted here. But it seems that this would be playable for either side. After Black has played at 27, the right side is open at the edge, so the right side is not where White should put the focus on. This is the kind of matter that attention must be paid to. …Black 1 would initiate the sequence through White 6. On the left side both players have made equivalent two space extensions, but on the upper side White’s territorial framework [moyo] is bigger. Black 31 is a natural and good move. 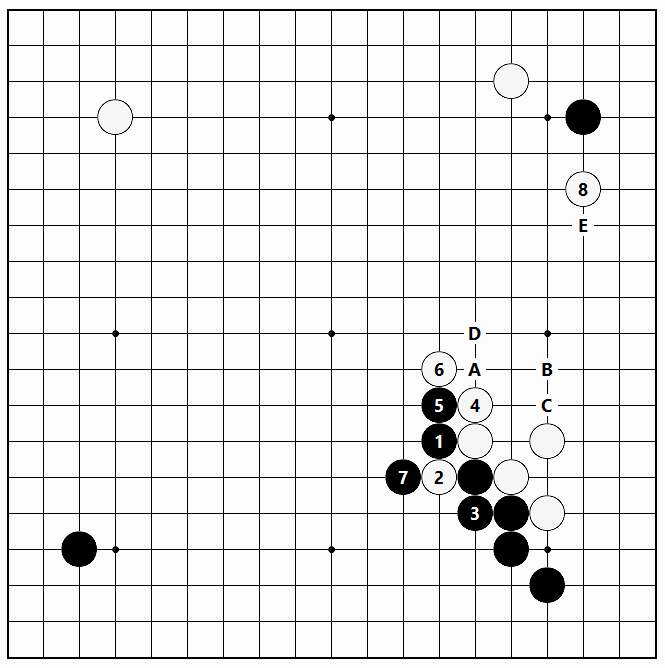 The proof of that is that if White fails to respond to that move, the attachment of Black A would be severe. White’s three stones in the upper right would come under attack, making the position one-sided in Black’s favor. Well then, Black makes the forcing move of 33 for White 34, then the turning move of Black 35. For professional players this is common sense (and for high ranking amateurs it is also common sense), but in this position it is not just the only move, but absolutely the only move that is eagerly desired to be played. 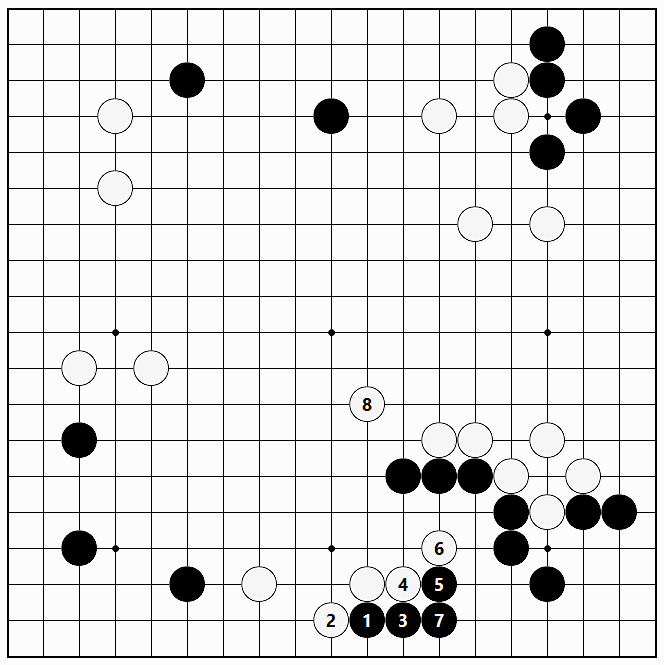 …Black’s aim to hollow out White’s position with the attack at 1. This move of Black 1 is severe. Using this move to strike at the corner of the position with Black 3 would be a little slack. Should Black 1 be answered by White 2, in the sequence to follow, Black keeps on the pressure through 9, and Black’s marked stone is shown to be greatly valuable. Replying to Black 1 with White 2 is very dangerous. Black cuts at 5, and if White responds at A, Black plays B. White B is countered by Black A. 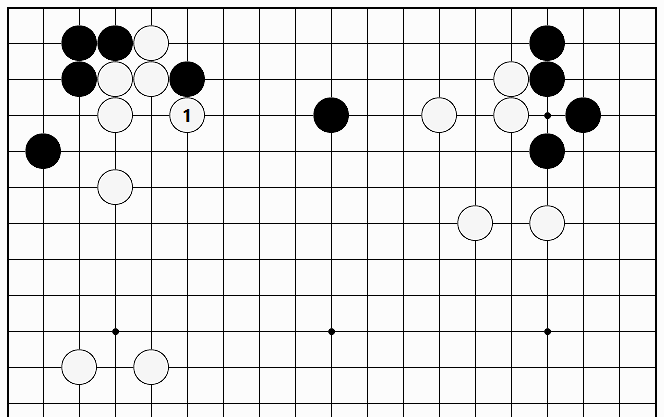 …and Black makes the resolute play at 1, as might be expected, this feels unreasonable. White comes at Black from above with 8, and should White’s group below tide over the crisis, Black’s play will have been slack. First and above all, Black turns at 35 before initiating action, and White has to make the group on the lower side safe and secure with the move at 36. Black is not dissatisfied with this exchange, either. How is this to be evaluated? Does the reader appreciate the value of the thickness Black made with the move at 35? 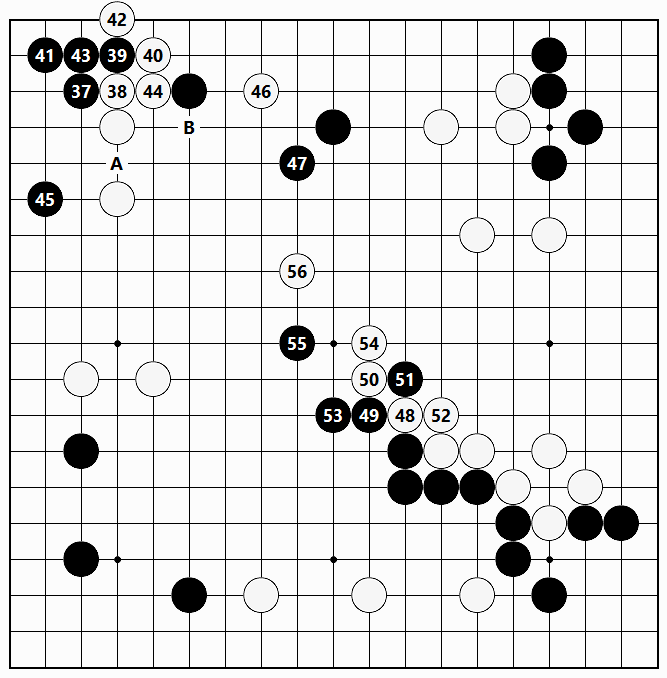 Although that move offered no immediate territorial gain, in the future the turning move would necessarily come to play an effective role in the game. 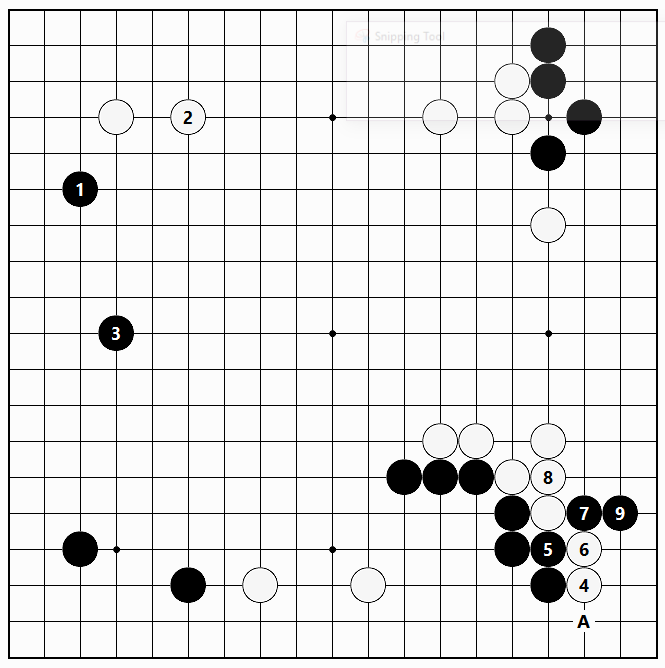 Here, young Shoji invaded at the 3-3 point with Black 37. This is a tight territorial move much in keeping with young Shoji’s style, but as might be expected it was questionable here. Although this move fits perfectly with his characteristic way of playing, it aims at taking too much profit. Here, the ordinary jump of Black 1 would be clear and simple. For White to now defend the right side would make no sense since the territory there is open at the edge, so to temporize, perhaps defending with the move at 2 is in order. In that case, Black invades at 3. whereupon White 4 leaves open the possibility of the peep of Black A followed by Black B. There are all sorts of potential [aji] in this area. One might even feel that Black 1 and 3 are kind of mediocre moves, but in go one cannot always play sharp and brilliant moves, either. Furthermore, should Black play the move of 1 as the immediate invasion at 3, although it might seem to be severe, it would incur a counterattack by White, and so it would not be good. One way or another, isn’t Black 37 an overplay? 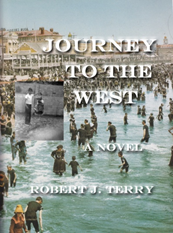 As the game proceeds, the reader will see that this is true. Young Hashimoto played Black 41 in order to make his stones work more, so as to slide farther, to the point of Black 45. This actually hastens Black’s downfall since the invasion of White 46 makes the game promising for White. In response to Black 47, the two-step hane of White 48 and 50 works perfectly well. Once White splits Blacks groups with 56 and attacks, it may be said that White holds the advantage in the game. …as might be expected here Black must patiently connect at 1. Should White block off the side with 4, Black will cut and move out with 9 and 13, starting a fight. 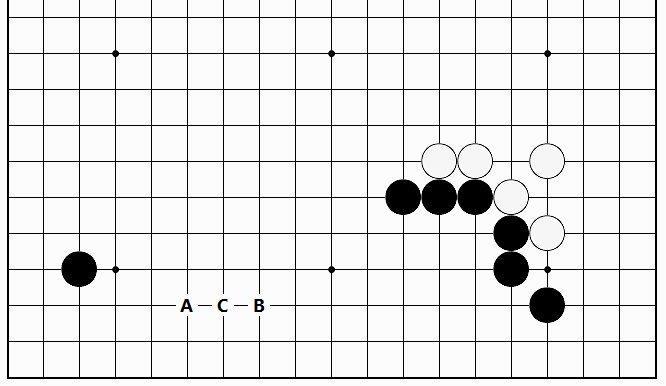 The strong point of Black 1 is that Black A is a forcing move, and in this board position the upper side is more important than the left side. Therefore, this way of playing would be better. …perhaps White should make the thick and strong hane at 1. I think that this is a playable variation for White, but I still think that this way would have been better for Black. When White gets in the move at 46, the game is already not an easy one for Black. Professional go is frightening, you know. Black 47 is the standard move to play here. Although Black 1 occupies an essential point, having White take the point of 2 makes it hard for Black to move out with the single stone. As might be anticipated, the upper side is too big here. 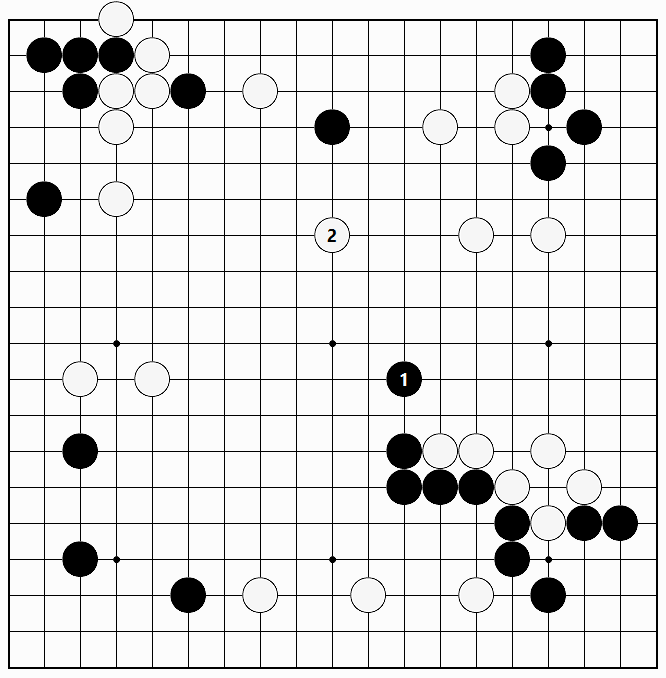 However, in reply to Black 47, the two-step hane of White 48 and 50 works precisely well in this position. 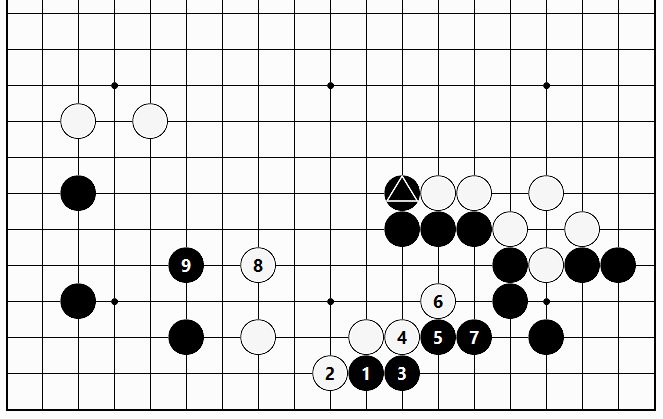 While building up the territorial framework [moyo] on the right side, White can next attack Black’s two stones on the upper side with 56. White is obviously playing in good form. The reason for that boils down to the 3-3 point invasion of Black 37. In this game the turning move of Black 35 in Figure 2 and the 3-3 point invasion of Black 37 in Figure 3 deserve close study. They are the highlights of the opening [fuseki]. The first was an essential point regarding the whole board position, and the second an overplay. Please savor the technical nuances concerning these moves. Those who wish to comment on the opinions expressed here may send their thoughts to info@GoWizardry.com. The most interesting responses will be addressed in future postings.